This isn't the photograph I wanted to post today - that was the one that got away. This fox loves to sleep on my neighbour's shed roof. He doesn't seem at all bothered that he is visible from the windows of the houses all around. In fact, when I opened my bedroom window to snap this shot he briefly looked up at me, then closed his eyes, put his head down again and adopted the relaxed pose you see above. But the picture I would have liked to have taken eluded me. 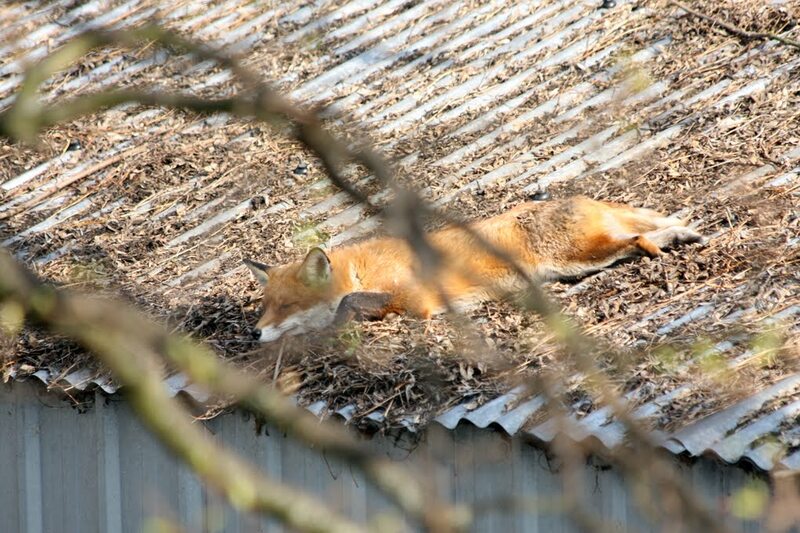 Early one sunny spring morning, I looked out of the window to see two foxes on the shed. They were standing on in the ridge at top of the roof rubbing noses, with a tree full of white blossom behind them, and the morning sun highlighting their beautiful russet fur. I didn't have my camera ready, so this picture will have to do - of a sleeping fox glimpsed through tree branches that are just started to bud.